Talk about evil! Can you imagine a drug company being so evil that they would knowingly mislead doctors and patients about a drug? It reminds me of the block buster movie, THE FUGITIVE, starring Harrison Ford (Richard Kimble) and Tommy Lee Jones (Gerard), about a crooked doctor who tries to frame and imprison Dr. Kimble because he's about to expose the truth about a faulty drug which the company aims to mass-market. The movie comes so close to the truth about Pharmaceutical companies today (i.e., the marketing of potentially dangerous and useless drugs). It is frightening. Truly, the love of money is the root of all evil as the Bible tells us in 1st Timothy 6:10. It is tragic when companies manufacture potentially dangerous drugs, which kill 100,000 Americans each year, just to make a buck. Not just any drug, but a drug that wasn't even approved by the FDA (you know, the people who are supposed to be protecting us). This is so wicked. The drug was tested and found to be as effective as a placebo (an empty pill that does nothing). Yet, Pfizer made billions ($2,700,000,000 in 2003 alone). This scam went on from 1995 until 2003. It's sickening. What's even more appalling is that the criminal company only gets fined for less than 5% of their total profits. How would you like to be able to rob people and then only have to pay back pennies on every dollar that you stole? Sounds like a good deal doesn't it? 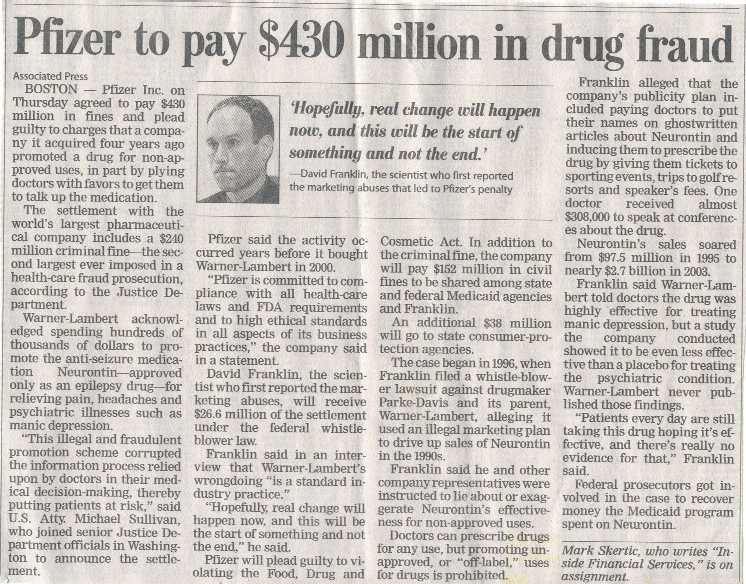 So Pfizer gets fines $430,000,000 for illegally robbing the public and insurance companies of nearly $10,000,000,000. The Newspaper article below was featured in the Friday, May 14th, 2004 Chicago Sun Times. This story was national news. The next time your doctor wants to prescribe a drug for you, do your homework on the internet! Find out what you're going to be putting in your body. Doctors are at the mercy of the medical boards and pharmaceutical companies. If you go to medical school, you will be taught DRUGS! You walk into a doctors office, and he or she gives you DRUGS! I went to a doctor who said I had high blood pressure and he wanted to put me on "emergency high blood pressure medicine" (as he called it). I said, "Aren't you going to recommend a change of diet, or an exercise program before using DRUGS?" I never went back, started drinking a lot of purified water each day, and my blood pressure turned out to be just fine. Listen folks, doctors killed 250,000 people last year in the United States. Doctors can be dangerous to your health. I mean, thank God for doctors, but the cut, burn and poison method of healing people is highly questionable. The drug companies work with the doctors to SELL MORE DRUGS. Doctors are trained in institutions owned by the same people who stand to benefit from the drug sales. Drugs, drugs, and more drugs! We're all a bunch of guinea pigs! The next time you read a magazine or a Reader's Digest and see a drug advertisement, look at the disclaimer on the back pages. It's so funny and scary at the same time. Who in their right mind would take any drug whose maker provides pages of warnings and potentially dangerous side effects? Oh my! Thank God that the drug companies are required to disclose all that information. Sadly, millions of people are suffering in horrible pain and need some type of relief, so they have little choice but to take the drug(s) which are available to them. My concern is that very few doctors inform their patients of the possible dangerous side-effects of the drug. People have a right to know. But you know as well as I do that if doctors warned people, then only half of the patients would take the prescribed medications (for fear of being the next drug victim). That means the drug-companies would lose billions of dollars! For some reason, people don't seem affected by viewing such horrendous drug warnings on their television. It's just more entertainment to them. But when your doctor tells it to you in his office, face-to-face, that's a whole different story. Neurontin is just one example of numerous highly questionable drugs which are still being marketed and prescribed today. I had been prescribed Gabapentin for a couple years for my herniated cervical disks. The herniated disks in my neck are pinching my spinal cord, which causes pain and tingling to extend down into my right arm and sometimes into my right leg. Honestly, the medication has done absolutely nothing to help me, except make me a bit sleepy. According to Wikipedia, “Gabapentin is also known to induce pancreatic acinar cell carcinomas in rats.” SOURCE Gee whiz, I feel loved. The next time you get bored, do a web search on the hazards of some common substances we are often exposed to: Aspartame, Fluoride, Sodium Aluminum Phosphate (baking products), Tylenol, aspirin, vaccinations, antiperspirants, Canola Oil, etc... it's CRAZY. There are literally thousands of hazardous products on the market. 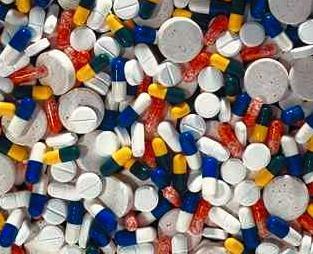 One hundred thousand Americans die each year from legally prescribed medications. This doesn't include all the people who die from allergic reactions and severe health complications arising from other foods and products we trust. I'm simply trying to warn everybody, because we're being turned into guinea pigs. The best thing is to do your homework, which is your legal right. God bless you and take care of yourself. Please understand that this is all merely my own unqualified opinion. Just 1 out of every 5 dollars the drug industry collects goes to drug research. Some drug companies spend almost twice as much money for advertising and marketing as they spend for research. Drug industry profits are so large they outstrip every other industry's profits by far (3). Drug companies are the most profitable industry. In 2001, a year which saw a drop in employment rates, a plunge in the stock market and symbols of America's economy literally come crashing down, the drug companies continued their reign as the most profitable industry in the annual Fortune 500 list. While the overall profits of Fortune 500 companies declined by 53%, which was the 2nd biggest dive in profits the Fortune 500 has taken in its 47 years, the top 10 U.S. drug companies increased their profits by 33% (3). Collectively, the 10 drug companies in the Fortune 500 topped all 3 of the Fortune magazine's measures of company profitability for 2001, according to the magazine's annual analysis of America's most important companies. These drug companies had the greatest return on revenues, reporting a profit of 18.5 cents for every $1 of sales, which was 8 times higher than the median for all Fortune 500 industries, easily surpassing the next most profitable industry, which was commercial banking with a 13.5% return on revenue)(3). The system is badly broken and in need of a change. We cannot spend over one trillion dollars for health care just to improve profits for drug companies. We have the capital to more than adequately treat nearly all people. What we need to do is shift our perspectives and priorities. This emphasis on drugs is one of the main reasons why spending for prescription drugs is the fastest-growing category of health care expenditures. It is also one of the major factors contributing to the fact that doctors are a major leading cause of death in the United States, due to the fact that they have an over reliance on using drugs as 'patch-up' solutions, rather than seeking the cause of the problem. (2). Angell, "Is Academic Medicine for Sale? ", p.128. Biblical Support for NOT Vaccinating | Crib Death or Vaccine Death?